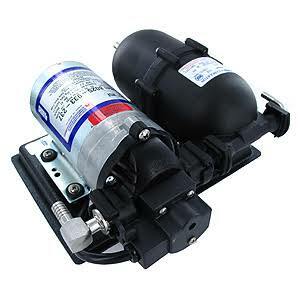 Superwater.com offers Discounted ( **Class D ) Freight Shipping and Insurance on All 804-001 SHURflo Mini Water Boost System 60 PSI Orders. The increase in popularity of non-carbonated drinks and the inconsistency of city water pressure and flow requires the need for a water boost to deliver quality drinks in many installations. The SHURflo # 804001 Mini Water Boost System will support two standards flow valves or one fast flow valve. - Equipped with a SHURflo pressure reducing valve for added safety against fluctuating water pressure and flow, the pressure reducing valve eliminates the need for costly water regulators.